It’s no surprise that many of our fondest memories recall endless summers and lazy days at the beach. Holidays are, after all, about escape and relaxation. But much of our enjoyment is directly related to the lifestyle – the casual, social way of living determined by the design of both the traditional bach and the modern beach house. 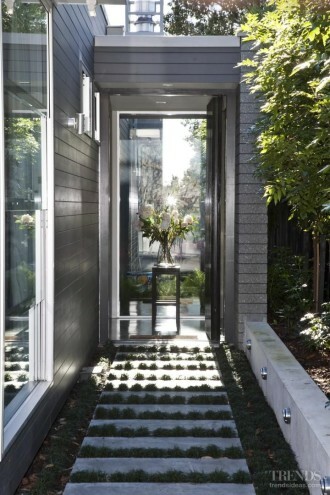 It was this relaxed, indoor-outdoor living environment that the owners of this city house wanted to re-create, architect Darren Jessop of Jessop Architects says. 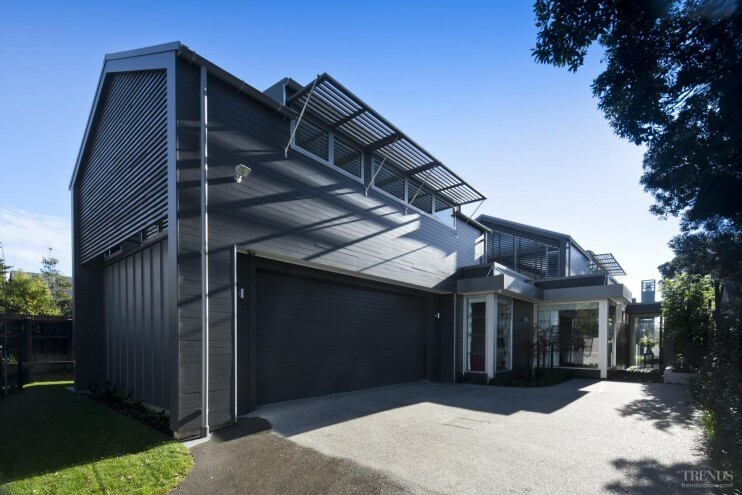 Another key design influence was the traditional boatshed, which is evident in the front facade facing the street. To create a transition between the public and private spaces, the top floor of the end wall features timber slats over full-height glazing. Eyebrow shades above the dormer windows are another screening device that provides sun protection and helps to soften the look of the facade. Mostly two storeyed, the house was designed as two separate volumes linked by a single-storey flat-roofed section. 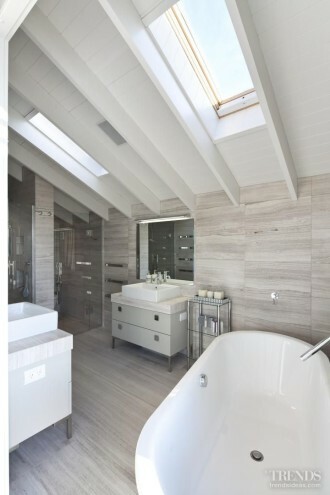 As well as lightening the mass of the building, the split-roof design creates exposed end walls on the upper level, allowing more light into the interior. Because the site is long and narrow, Jessop chose to position the main entrance to the house a considerable distance down one side. 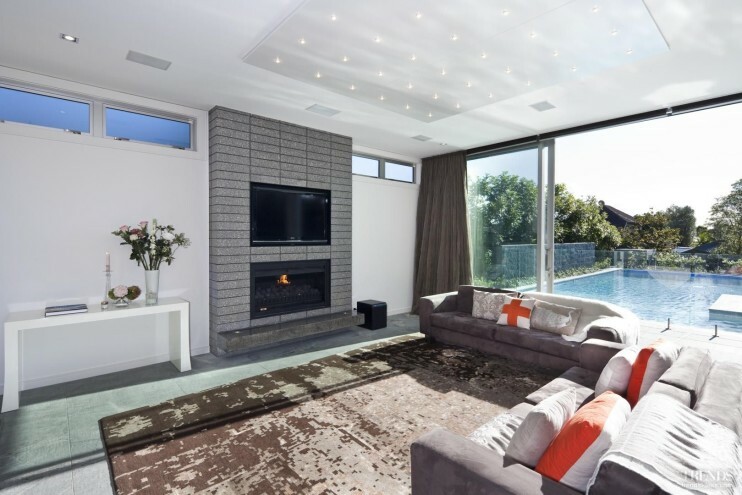 The main living space incorporates the kitchen, casual and more formal dining and living areas, and flows seamlessly to an outdoor room with a louvred roof. The kitchen has a casual, café-style banquette seating area, a 5m-long island and cabinets in white lacquer and dark-stained oak veneer. 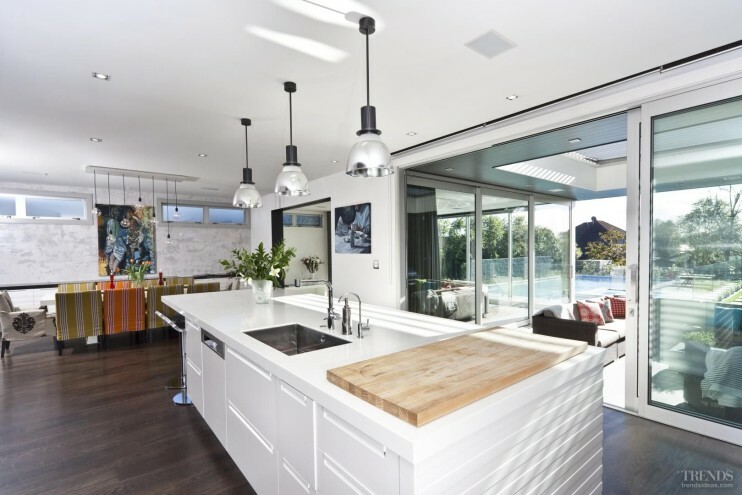 The island in the kitchen serves several purposes. 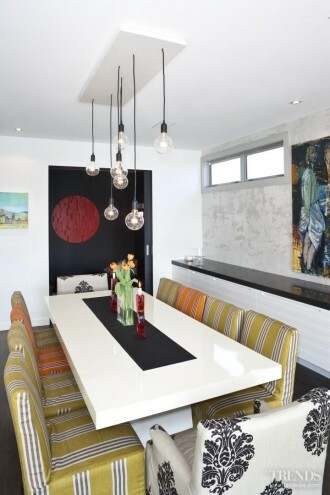 As well as being the main food preparation area, it is also the social centre of the living area – a casual eating and homework area, and a gathering place for friends to sit with a glass of wine. To provide separation for children and adults, there is a 3.5m x 4m soundproofed, sunken nook off the main living room. This room, which is a step down from the living area, is used as a home theatre. 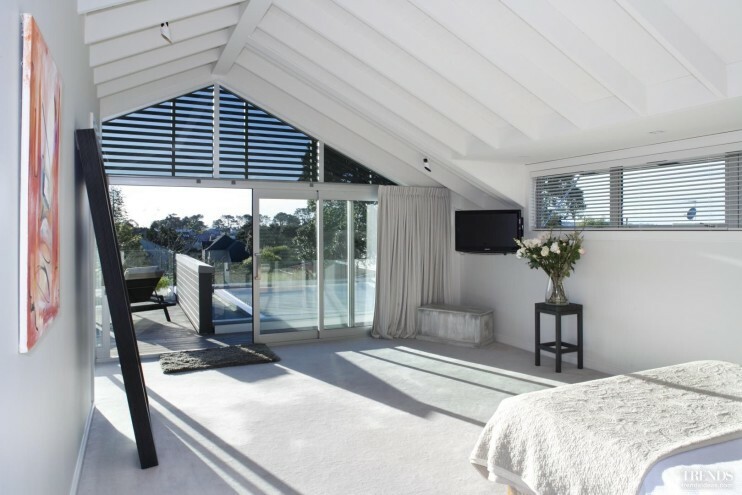 The master suite on the top floor overlooks the pool and has a view of the harbour. Here, the boatshed reference is clearly visible in the gable roof and exposed, white-painted rafters. Again, timber slats help screen the sun and provide a buffer between the public and private spaces. 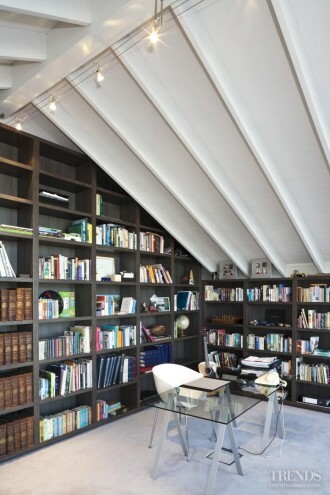 Other rooms on this floor include a study-library, which has a full wall of built-in bookshelves. 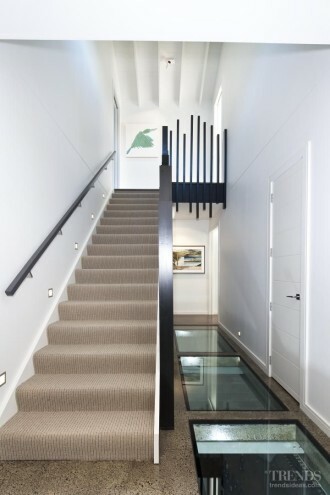 An underground wine cellar, with a 20mm-thick glazed ceiling that forms the floor of the entry hallway above, is another feature of the house.